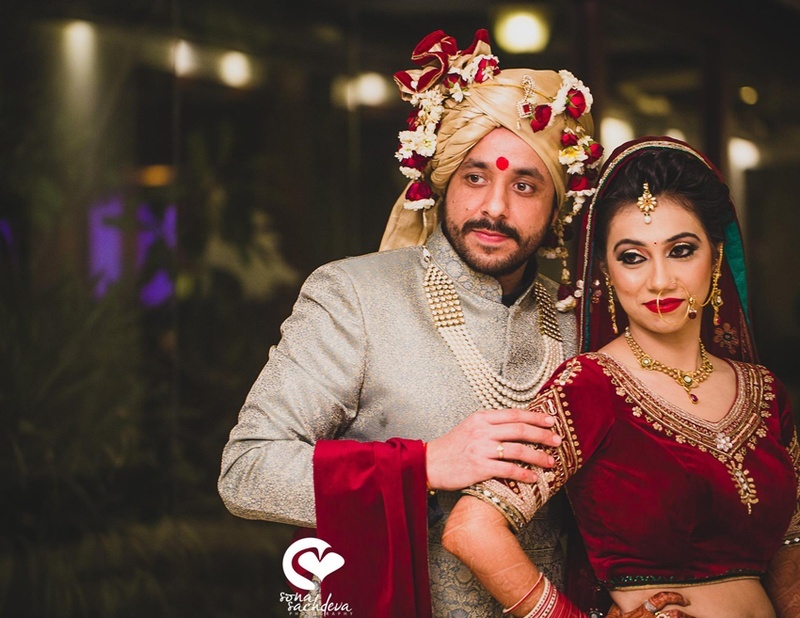 Richa and Hitesh had a simple, small backyard Delhi wedding with stunning outfits, jewellery and a whole lot of love. Right from the pre-wedding shoot where this couple gave us all of the Bollywood flashbacks to the intimate wedding ceremony with overflowing emotion – each element of Richa and Hitesh’s Delhi wedding was beautifully weaved together by the bride and groom themselves. Planning, researching, and running through the streets of Delhi to make their dream wedding a reality. Their photographer Sona Sachdeva was a close friend of the groom, which added an element of personalization to each photograph captured at this beautiful Delhi wedding. Their Pre Wedding was shot at Humayun’s Tomb is a popular spot for pre-wedding shoots, giving your pictures an old world kinda charm. Sona Sachdev Photography captured Richa and Hitesh in their most natural state – laughing, talking and enjoying each other’s company. They later continued their shoot at Prasad Farms in Mandi Hills, Chattarpur. The stunning Richa wore a flowy red and black saree with a sheer back blouse that gave us so many flashbacks from Sushmita Sen in Main Hoon Na. A day-time, open air affair with all the elements of prettiness. The dapper groom-to-be was dressed in a royal blue and white blazer with a matching bow-tie and tuxedo shirt to match his gorgeous bride, Richa. She was dressed in a stunning lehenga in a combination of sky blue and navy with beautiful gold motifs and silver sequins. Along with her dual toned lehenga she wore chaandbali design earrings and a jhoomer too. The blue enamelling on the jewellery made it perfectly match her entire ensemble. Dressed to kill, Richa and Hitesh exchanged rings as a symbol of never ending, undying love in the presence of their closest friends and family. Their backdrop was simple yet beautiful, made out of strings of fresh white marigold flowers along with orange ones to add a pop of colour – And let’s not forget that bright bubblegum pink cycle rickshaw laden with yellow marigolds – Indian weddings just seem to be so incomplete without them! Have you ever seen a bride pull of a brocade kurta like a pro at a mehndi ceremony? Probably not. Well, this stunning bride set a new trend for 21st century brides changing up the fuchsia pinks and canary yellows with her unusual gold and bronze brocade kurta and red lehenga underneath it. The kurta had an uncommon design of panelled slits which beautifully showed the volume of her red and gold lehenga underneath – absolutely stunning. The décor was full-on desi with marigolds everywhere, cycle rickshaws and Rajasthani dolls suspended from tree branches. Richa’s mehndi covered her full arms and had imprints of a bride and groom on her palms – artistry portrayed brilliantly, with the littlest intricate details done right. We love the warmth and homely-ness of this intimate family haldi ceremony. The blatant love and happiness visible on Richa and Hitesh’s faces warmed our hearts too. Sona Sachdeva Photography captured this couple portraying their most candid, raw emotions in a beautiful way. For the wedding, this bride continued to wow us with her gorgeous outfits and ever-stunning jewellery picks. Richa picked an all-velvet deep red lehenga with bold gold hued embroidery on the body of the lehenga. Since the neck yoke and the half-sleeves on her blouse were fully embroidered too, this beautiful bride decided to keep her jewellery minimal and tasteful, while the minimal accents of teal green added an unusual touch to a traditional red lehenga. Hitesh too, didn’t stick to the old-school cream textured sherwani, but rather opted to wear a shade of powder blue and gold along with a maroon dushala to complement his bride beautifully. Lots of love, laughter and light is how we would sum up their wedding ceremony – so many similing faces, pretty light décor and this charming couple!